A few months ago I was approached by one of my regular clients who has become a really special friend over the years to undertake a project not quite like anything I had done before. She and her family live in a large listed property which has an entrance hall you might imagine should only exist in a grand hotel, with a sweeping stairway up to the first floor. The challenge came to me as they had fallen in love with a vast wooden carving of a tree which was very elegant and beautiful but they would not be able to obtain permission to attach the piece to the wall in their listed home. 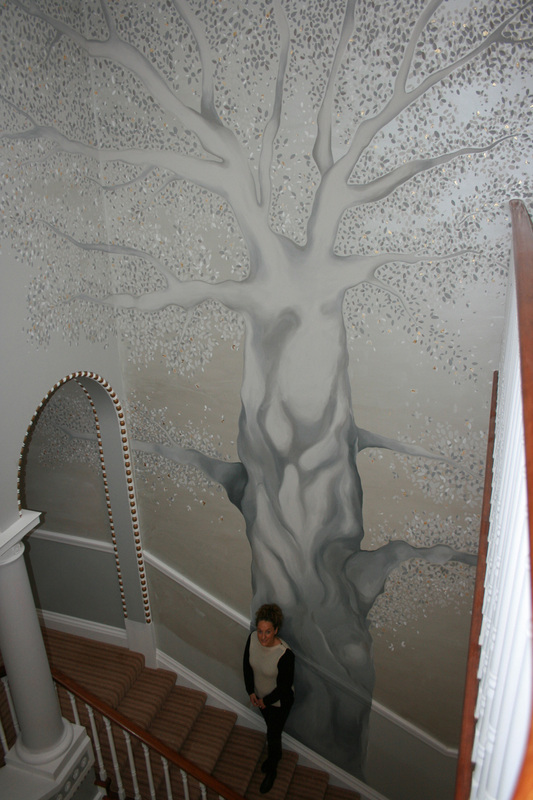 ‘The Painted Tree’ was our solution – by selecting some metallic paints and other mixes of dark and light I was able to create a feeling of movement and grandeur climbing up the wall from the base of the stairwell right up to the skylight! The piece is finished with gold leaf and glistens to pick up the shine from the tiles in the ground floor walkway. This is not my usual form of work, I can tell you I missed my comfortable oils to work with and I was secretly petrified of the heights while working for 3 weeks on a scaffolding as high as 24ft! However, I was so driven to provide the finish the family were after that I rolled up my sleeves, planned and executed this piece as best (and as quickly!) as I could… and I love it! I’m not sure that it did much for my fear of heights but the piece looks spectacular as it is revealed from the covered entrance into the property, growing out from behind the grand piano and drawing the eye up to the magnificent ceiling and skylight giving a real sense of space and wow factor. Since then, it has been back to the comfort of my canvas and oil paints but I would not rule out any more murals in the future!